"This is an EASY recipe. My son doesn't like cabbage but will eat this like crazy. 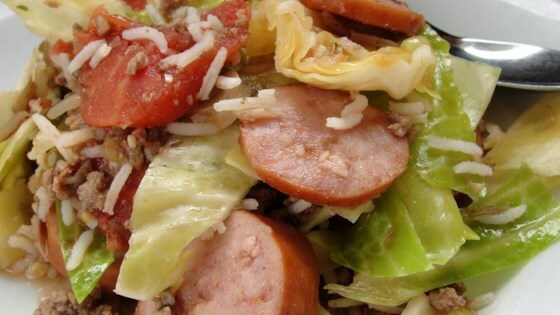 You can make it low-fat by using ground turkey and low-fat sausage. They won't know the difference." Combine ground beef, smoked sausage, onion, celery, and garlic in a large stock pot over medium-high heat. Cook and stir until beef is evenly browned, about 5 minutes. Stir in cabbage, tomatoes, water, and rice. Season with garlic salt. Easy, comforting homemade soul food. The jambalaya can also be prepared in the oven. Preheat oven to 350 degrees F (175 degrees C). Follow recipe as directed, but for Step 2, place jambalaya in the oven and cook, stirring once, until rice is tender, 35 to 45 minutes. This is a delicious, great for a meal or side dish.